A recap of my favourite moments, and not so favourite boarding on awkward. The opening scene belonged to Kevin Hart. It was definitely his moment, and not only that, but his show. Hart didn’t need a co-host, and it was almost like Johnson was there to help Hart step up on the podium. His two particular stand up moments, Superhero monologue and the opening act. But it wasn’t just the hosts performances that I found amusing, but a couple of the award announcements, and tributes were amazing. The one that stood out the most, Ryan Reynolds winning Best Comdeic Performance, and the opening number to announcement his win, was spectacular! To celebrate his win, a horde of Deadpool’s and a performance from Salt-N-Pepa singing “Shoop”. I guess handing all that popcorn, was enough to give Kevin Hart butter fingers during Melissa McCarthy’s acceptance for her Comedic Genius award. While reaching to give her a hug, Hart dropped the Popcorn statue and broke off a kernel, where Melissa threatened to trade hers for his. Of course all “insults” like Kevin Hart being Dwayne Johnson’s Assistant, were all in good fun, with McCarthy pulling Hart in for a hug after her speech. Another highlight was the tribute to Will Smith and him being honoured with the Generation Award. No it’s not a award for being old, as Smith thought it might be for. To congratulate his win, The Lonely Island put on a performance of some of Will’s greatest hits. It was a great show, full of fun energetic charisma. I feel like my thoughts and opinions will change of Elizabeth Olsen’s, Scarlet Witch character. I wasn’t a fan of her in Avengers: Age of Ultron, but after that Sneak Peek her character is going to have a huge improvement. I’m also excited to she Scarlet Witch really come into her powers. But the real character I’m most looking forward to, Black Panther. Wow, wow, wow. That trailer was amazing! Can’t say the same for Margot Robbie’s dress though while presenting, but I’ll over look it after seeing her stellar performance in this new footage. I mean wow, hopefully those rumours aren’t true, that all the jokes they’ve used in the trailers is it for the movie, and that’s why their doing reshoots, because that would be unfortunate. But if we can expect more jokes like we just saw in this new trailer, I think this movie will do great. It’s definitely funnier then the previous ones we’ve seen. I really liked this trailer, but I had one small problem with it. I know it’s set in the Harry Potter universe, but am I the only one who thinks that maybe they should have created its own theme tune to go with it, instead of using the Harry Potter one? Because when I hear that famous tune, I think Harry Potter and his story. I would like to see FB have it’s own, that way when I hear it, I think about that movie, not another. 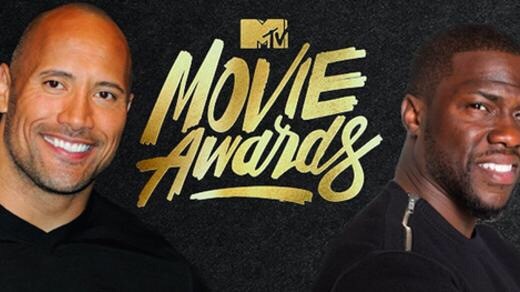 And of course, you can’t forget about the outfits shown at tonight’s MTV Movie Awards. My favourite’s? Charlize Theron, Halle Berry, and Kendall Jenner. All three wore a black number with a little bit of black lace to top up their outfits for the night. But of course when there’s highlights, there must be moments that just missed the mark. Dwayne Johnson. While he wasn’t down right awful, I feel he was only there to help Kavin Hart shine. Especially in that first number, the opening act. I didn’t think Johnson was overly funny, nor that amusing. The entire time my attention was on Hart. But Johnson wasn’t that bad. I think he got more into the rhythm later on, during he Superhero monologue, and the rap sequence. I know a lot of people are fans of hers, but Halsay didn’t quite do it for me. Both outfit choice and her performance. Since seeing The Huntsman: Winter’s War trailer, and hearing her song, “Castle” in it, I was kind of excited to see her performance, but once it happened. Disappointment. The whole performance, including her vocals, seemed a little flat to me. Now this next miss, makes the other two look like hits. The opening for the Breakout Performance…What was that? It was painfully awkward, and makes me shake my head at what the MTV awards have become. I don’t know who came up with the idea for that skit, but it wasn’t funny, and just down right horrible. Not the opening Daisey Ridley deserved to have to accept her win, as best breakout performance. But at least she got a better one, when accepting Star Wars: The Force Awakens as Movie of the Year. Not many misses to talk about, the last one is worst dressed. Don’t know what Margot Robbie was trying to do. Maybe she was trying to follow suit with, Theron, Berry, and Jenner, but got sidetracked and took a detour. But it was definitely a worse dress for me, along with Halsey’s performance outfit. I’m curious to, what was everyone else thoughts on the MTV Movie awards? But most importantly, those trailers! Didn’t you like them as much as I did, or were you expecting more? Also, who were your best and worse dressed?